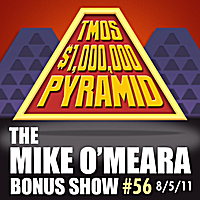 From Devil Town, in Virgina...This is the TMOS $1,000,000 Pyramid! Today's special celebrities are: Mike O'Meara, Buzz Burbank, Robb Spewak and Oscar Santana! With your host, Bob Jewbanks!